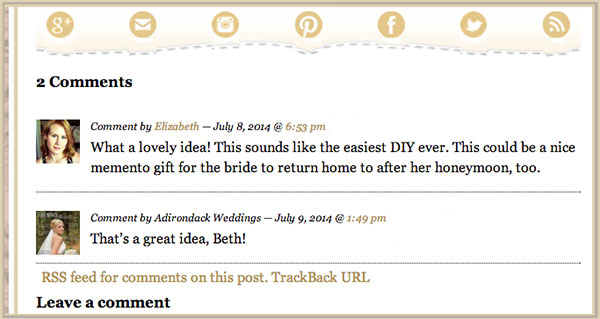 ADK brides & grooms: join the conversation! We are lucky to have some loyal followers who comment on many of our blog posts. You may have noticed that select readers have photos that appear next to their comments, as illustrated in the screen capture below. Wondering how your photo can appear next to your comments here on the Adirondack Weddings website? We’ll show you how it’s done! Click or type http://gravatar.com into your web browser. You’ll see a “Log In/Sign Up” link near the top of the website. Enter your email address and then choose where you want to upload your profile avatar image from by clicking “Get Your Gravatar.” You can either upload a file from your computer’s hard drive, an image from one of your accounts on the internet, or a previously uploaded image. You should receive a confirmation email from Gravatar. Click on the link provided in the email and you should be able to choose how to input your image. Crop your image by moving the box that is overlaid on the image you choose. Then click the “Crop and Finish” button. Now you’re set! Come back and comment on our site to make sure it worked. Having a Gravatar helps you personalize your online identity across the web. Cool, huh?